• Version used for the screen captures: WS.WebTV Professional 1.4.0.3 and 1.7.5 (all extensions enabled). Some options/features might be different, respect your WebTV, depending on the installed version and extensions you have purchased. Easy/Automatic Creation Mode: This mode is intended for YouTube, Vimeo or Dailymotion videos. It allows you to create an EmbedClip without having to enter any embed code; you will only need to supply the video URL and the WebTV will do the rest for you. NOTE: You will be able to edit the Clip, or embed codes, once it has been created. For more info, check the other EmbedClip tutorials. How to get the Vimeo API Info? Read the tutorial. 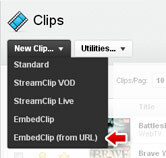 Click on "New Clip..." button and select "EmbedClip (from URL)". Enter the URL of the video (from YouTube, Vimeo or Dailymotion). In case the URL is from YouTube, the following options will be displayed (only applies to the Flash video player). • Use WebTV Video Player: If you select Yes (recommended), the YouTube video will be played back with the WebTV video player (only on HTML5); otherwise, the YouTube video player will be embedded instead. • Quality Mapping: This section will only be visible if the previous option is set to Yes. Select how do you want to map the YouTube qualities to the WebTV one. The WebTV will fetch the title, description, image and duration from the corresponding Website and will also apply the appropriate embed code. NOTE: If you click Save[+], the system will allow you to enter another URL after finishing the process.